Blog - Have You Reserved Yours Yet? Have You Reserved Yours Yet? You can now add one of the world’s most beautiful, beloved, and scarce coins to your holdings – at an unbeatable low premium! Thanks to its gorgeous design, the Mexican Silver Libertad has become a perennial favorite throughout the world. Its obverse displays a winged image of Victoria atop the Mexican Independence Victory Column. Behind her are the famed mountains of Popocatépetl and Iztaccihuatl. On the reverse, the current Mexican coat of arms is surrounded by historical coats of arms from the past. The Libertad’s design is beautifully executed with intricate engraving and superb eye appeal. Not only is the Libertad highly attractive, but it’s also quite scarce compared to other leading bullion coins. Whereas tens of millions of Silver Eagles and Silver Maples are struck each year, annual 1 oz silver Libertad mintages are often just 500,000 to 1,500,000 pieces. Due to their rarity, some backdated issues now trade for $100-$200 each! 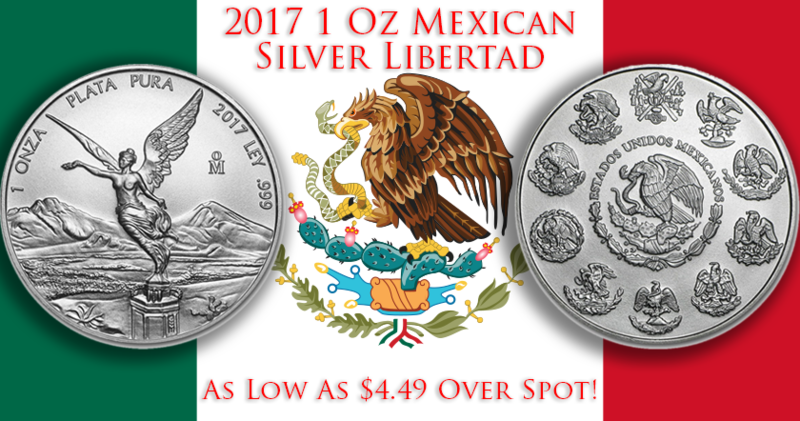 Today, you can reserve your 2017 Silver 1 Oz Mexican Libertads for as little as $4.49 over spot! We believe this is the lowest price of any major dealer. If you see a better price, we want to hear from you! All of our Libertads are fresh coins from an authorized Casa de Moneda de Mexico distributor. Increments of 25 are delivered in original mint tubes. Even current-year Libertads can be a major challenge to source. One official distributor sold out of their batch of 2017 issues within 15 minutes! There is no guarantee that more can be obtained later in the year. so take advantage of this offer while coins are still in stock!